At E. & J. Gallo Winery, we have long been committed to water efficiency through conservation, development and implementation of new technologies, and updating practices to maximize water use. With regard to new technologies, we are not only enhancing our wine production with innovative irrigation, we also envision this technology extending to other areas of agriculture. Our company is the world’s largest family-owned winery and the producer of award-winning wines and spirits featured in more than 90 countries. A pioneer in the industry, Gallo crafts and imports wines and spirits to suit diverse tastes and occasions, from everyday offerings to boutique, luxury bottlings. Our company owns 15 wineries and more than 20,000 acres of vineyards. In addition, Gallo maintains contracts with growers around the state that assist with yearly supply. We operate on a large scale and so have great opportunity for innovation. Gallo has a lot of metrics and data in place, but our current water efficiency project began with a NASA satellite image. From the satellite image we could see extreme variability in grape vine water use. So, we began to explore if we could optimize the amount of water applied to each vine based on its true water need. We set out to discover if we could make a smarter irrigation system, based on satellite data, into a reality. Innovation requires cross-functional collaboration. I know a lot about grape vines, but I really didn’t know anything about irrigation system design or infrastructure. Thankfully, IBM caught onto the vision of this project. With IBM, our team had a system infrastructure expert, engineer and theoretical physicist working together to do what I was envisioning. The team has since grown to also include electrical engineers, Gallo irrigation operators and some of our irrigation providers. With all our different disciplines, we had to learn how to talk to one another in a way that helped move us forward. Once we overcame that challenge, we gathered everyone’s perspectives. We ideated and learned together to get to the right solution. 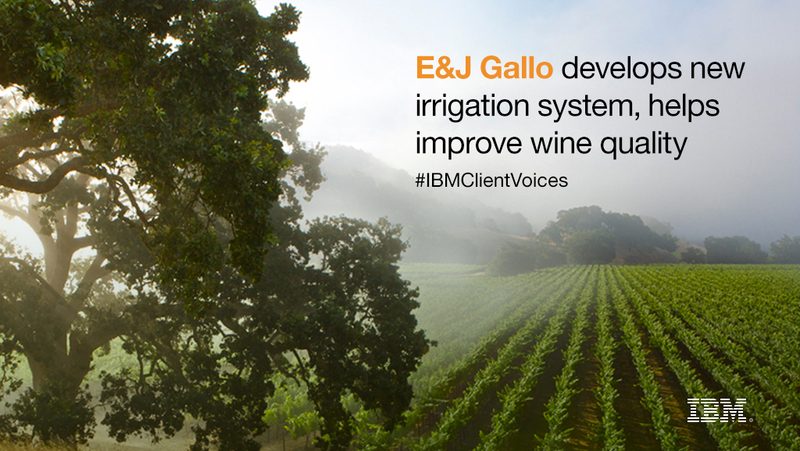 We ultimately created a cognitive irrigation system to improve water efficiency in our vineyards. What our solution looks like is that we can now deliver water to a specific section of the vineyard. This is done independently of all the other vineyard sections. Since the NASA satellite looks at the Earth’s surface in 30 by 30 meter pixels, we began looking at our vineyards in these same 30 by 30 meter areas. That basically means five or six vine rows wide, by about 20 to 25 vines long. Each water line is wrapped with sensors that wirelessly and continuously communicate environmental conditions and vine stress to a central computer. This hyper-localized information, and real-time unstructured data, like the satellite imagery and weather forecasts, is automatically processed. Then, the system provides recommended watering instructions. Due to our size, Gallo can pilot projects at a larger scale than most vineyards. We started this project with 10 acres. After about six weeks of running the system, satellite imagery showed us that everything within the test grid was uniform. What previously looked like a checkerboard showing vines of all different stages of growth and water stress, now looks optimally healthy. Plus, after a single growing season, we found that water use in the test vineyard was reduced by 16 percent while crop yield increased by 30 percent. Also important, the quality of our grapes improved, making our wine even better. 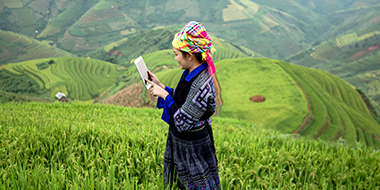 We at Gallo are challenged to not just maintain this kind of technology within our company, but to also extend it to our external grower community. We can also see this cognitive irrigation platform being applied to other areas of agriculture to save water. The technology may be especially useful in California, which is in its fifth year of severe drought. Our vision of sustainability and water efficiency definitely extends beyond our vineyards. Learn more by listening to the E. & J. Gallo Wild Ducks podcast below or by reading the case study.